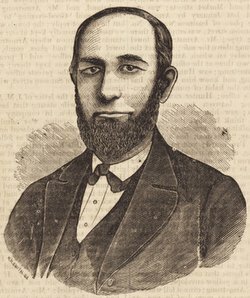 The night of January 23, 1878, a man was found on the ground with a serious head wound, not far from the home of Ford W. Davis in Camden, New Jersey. Near the wounded man, a hammer and a hatchet were found, each marked with the initials F. W. D. The man was identified as Philadelphia music publisher, John M. Armstrong and when it was learned that he owed Ford W. Davis a sizeable amount of money, Davis was arrested. But Armstrong also owed $12,000 to Benjamin F. Hunter who had insured Armstrong’s life for more than double that amount. Armstrong was taken to his home in Philadelphia, across the Delaware River from Camden, to be treated for head wounds. As a friend of the Armstrongs, Benjamin Hunter was among the first sent for by the stricken family. In the guise of helping, Hunter suspiciously rearranged the bandages on Armstrong’s head, reopening the wound. But when Armstrong died, Ford Davis was charged with his murder. Some days later a young man named Thomas Graham was drowning his sorrows in a Philadelphia saloon. Laden with guilt, Graham made statements about the Armstrong murder that were incriminating enough to have him arrested. In jail, Graham made a full confession. Graham was an employee at Benjamin Hunter’s hardware concern and Hunter had offered him $500 to kill John Armstrong. Graham was in need of money and readily agreed. They made a plan and set a date for the murder and Hunter made arrangements to be in Virginia that day. But Hunter returned to find Armstrong still alive — Graham’s nerve had failed him. Undaunted, Hunter came up with a more detailed plan to murder Armstrong. He gave Graham a hammer which bore the initials F. W. D. then had Graham mail a postcard to Armstrong, purporting to be from Ford Davis, asking Armstrong to meet him in Camden. Graham was to kill Armstrong with the hammer then leave it behind to frame Davis. Graham lost his nerve again but this time lied and said Armstrong never showed up. Hunter decided not to leave anything to chance and met Armstrong, face to face, and persuaded Armstrong to accompany him on the ferry from Philadelphia to Camden. Graham, armed with the hammer and a hatchet that Hunter had given him, also initialed F.W.D., followed after them, riding in a different section of the boat. In Camden they took a streetcar and Graham followed on foot. They got off the car on Vine Street and Hunter left Armstrong and went back to give Graham the signal. Graham hit Armstrong once with the hammer, but lost heart before he was able to finish the job. He threw the hatchet away and ran back to the ferry. Hunter grabbed the hatchet and attacked Armstrong, striking him on the head. He left Armstrong severely wounded, with a fractured skull. After Graham’s confession, Ford Davis was released and Benjamin Hunter was arrested for murder. Benjamin Hunter pled not guilty to the murder of John Armstrong. The defense asserted that there was no evidence that Hunter was in Camden that night. They also provided numerous witnesses that testified to Hunter’s good character. And they challenged the indictment on the grounds that since Armstrong died in Philadelphia, the murder could not be prosecuted in New Jersey. It came out in court that Hunter had loaned Armstrong a total of $12,000 and to insure his loan Hunter had persuaded Armstrong to agree to a life insurance policy with Hunter as beneficiary. The amount of the policy was $26,000. 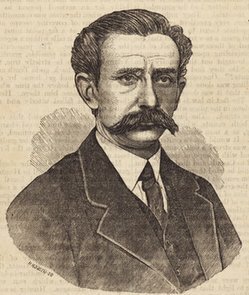 Thomas Graham had turned state’s evidence and it was his eye-witness testimony which tightened the noose around Hunter’s neck. The trial lasted 23 days and at the end the jury, with almost no deliberation, found Hunter guilty. Hunter’s attorneys appealed the verdict on the grounds that since Armstrong died in Philadelphia, Hunter could not be convicted of murder in Camden, New Jersey. The appeal was denied and Hunter was sentenced to hang on January 10, 1879. With all hope gone, Benjamin Hunter confessed. The amount of money he had loaned Armstrong had been so large that he had been losing sleep worrying about it. Armstrong appeared to be using the money to maintain a lavish lifestyle rather than improving his failing business. Hunter’s only hope of retrieving his money was Armstrong’s death. 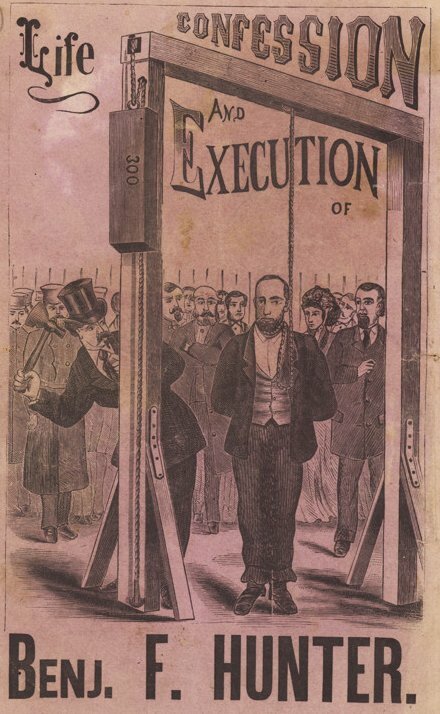 A week before the execution, Hunter attempted suicide, trying to spare his family and himself the indignity of a hanging. He was not allowed a knife or fork when eating, but he was able to tear away the top of a tin cup and used sharp edge to cut into his leg. Under a blanket he was able to cut an artery without the knowledge of the jailers on his deathwatch, and he had lost a pint and a half of blood before passing out and alerting them. He was saved from death and the execution went on as scheduled. It was reported that Hunter, due to weakness from the loss of blood, and fear of death had to be carried to the gallows; though some claimed he had been given brandy and was dead drunk when carried in. It took Hunter at least fourteen minutes to die of strangulation. Benjamin Hunter’s brother tried to collect on the life insurance policy and agreed to give the money to the Armstrong family. The insurance company refused to pay and Armstrong’s wife and administratrix of his estate, sued the company. The court sided with the insurance company saying they did not need to pay. The case was appealed all the way to the U.S. Supreme Court who overturned the verdict and called for a new trial. If the insurance company could prove that the policy had been taken out by Hunter as part of the crime of murder, then policy need not be paid, if there was no fraud, then the money must be paid. The false accusation and imprisonment of Ford Davis had completely prostrated him. Shortly afterwards, partly out of consideration for his innocent sufferings, Davis was appointed crier of the Camden Courts, and he held that position for many years. Hunter, Benjamin F., and Thomas Graham. Hunter-Armstrong tragedy the great trial : conviction of Benj. 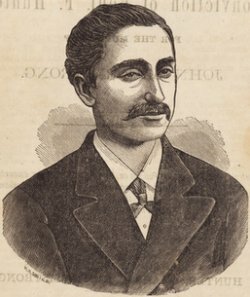 F. Hunter for the murder of John M. Armstrong. Philadelphia: Barclay, 1878. Lawson, John Davison. American state trials: a collection of the important and interesting criminal trials which have taken place in the United States from the beginning of our government to the present day. St. Louis: Thomas Law Books, 1921. Seen & heard by Megargee, Volume 4, Part 1. Philadelphia: Louis N. Megarcee, 1904. The Medico-legal journal … New York: Medico legal journal, 1886.